The Coronet, a delightful new addition to 4th Ave.
Tucson has many new bars and restaurants along the modern street car route, but unfortunately, many of them are dedicated to beer. I hate beer. I don’t care how trendy beer is these days. I still hate it. There I said it. Both Zocalo and the Tucson Weekly recently published feature stories about “famous” Tucson bartenders who make fancy mixed drinks. Also not my thing. What about my people? The wine drinkers. Where should we go for a decent pour at an affordable price in the downtown area? As a public service and in honor of the modern street car’s debut later this week, I have compiled a totally non-scientific review of 41 bars and restaurants along or near the modern street car route– from wine drinker’s point of view. 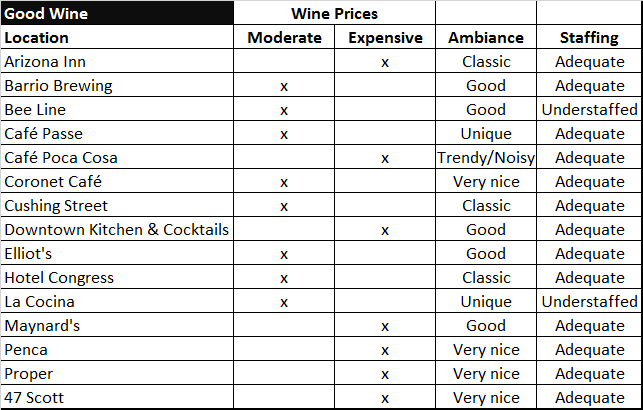 Lucky for us, the “good wine” list is the longest one, and many of these establishments have a good pour for a moderate price. In varying degrees, I like all of the places on this list. 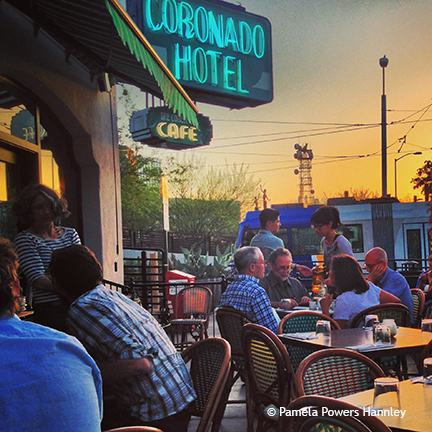 My favorites are the Arizona Inn (not cheap but hands down the classiest patio in Tucson for happy hour), The Coronet (how cute! 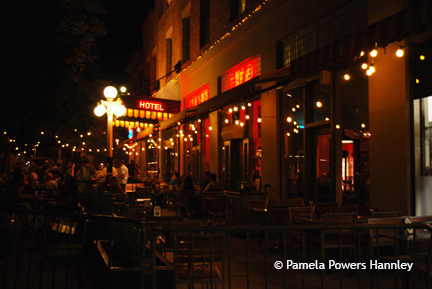 my fav of all of the new places on the street car line), Cafe Passe’s Beer Garden (which serves good wine, has great live music, and a truly 4th Ave feel), and Cushing Street (another classic, beautiful place with good variety). Barrio Brewing, in Armory Park, is the only micro-brewery to make the “good wine” list. They have not forgotten that beer drinkers have friends, girlfriends, and spouses who want more than beer. The Bee Line, one of my favorite restaurants on 4th Ave, was rated as “understaffed” because of the odd “wait in line to order” model. It’s a hassle. Hire more wait staff. 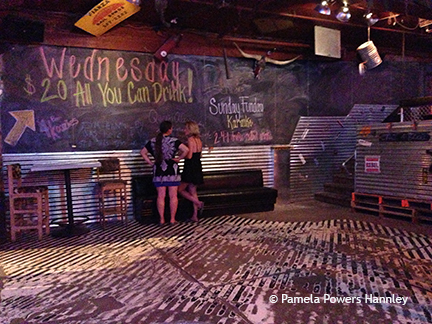 The Hotel Congress has the Tap Room, the Lobby Bar, The Cup Cafe, and the room with the stage. These four locations don’t offer the same wine selection or quality. Some of your more traditional bars made the “pretty good” list. Only one of them– Playground– was rated “pretty good” and “expensive”. Playground has too many TVs on the inside but a really classy patio. Too bad we had sticker shock at the price of a glass of Chardonnay. In the college bar genre, I like Che’s Lounge and Sky Bar. Really, Sky Bar is one of the best values for really cheap, “pretty good” wine. Caruso’s is another classic 4th Ave location with pretty good wine, a great selection of Italian food, and the best outdoor seating on the modern street car line. 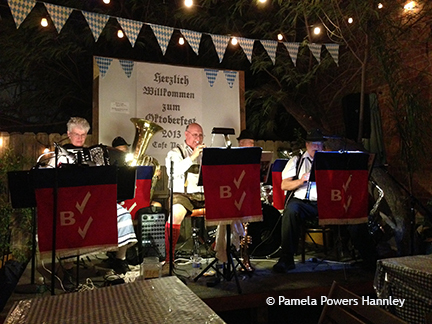 The Cafe Passe Beer Garden is wonderful– especially during Octoberfest. If you prefer wine to beer or other spirits, I don’t recommend these establishments– unless, of course, it’s your night to be a designated driver. These places pretty much have no food, either. If you venture a glass of wine at any of these, stick to red because it is less likely to give you a headache than white wine. You’ll note that as the wine quality goes down, so does the service and the ambiance. To be fair, when one goes to the Hut, the Rialto, or even the Wreck, drinking and eating are secondary to music and dancing. The Rialto serves Barefoot brand wine; there is a picture of a Barefoot Chardonnay bottle in the dictionary entry for “headache wine.” Although it’s on the edge of being a dive bar, the Iguana Cafe can be a lot of fun on Karaoke nights. Several older bars are not on my lists because I haven’t been there in years and didn’t want to unnecessarily dis them if they have changed their bar or food menus in my absence– for example, IBT’s, The District Tavern, Bumsted’s, O’Malley’s, Bison Witches, Frog’n’Firkin’, Gentle Ben’s, and the Auld Dubliner. The last time I was at IBT’s the crowd around the bar was several people deep, and I never got to order anything– another place with overworked bartenders. The others would probably fall somewhere on the line between “pretty good” and “bad” wine, since they are primarily bars, specializing in beer and television sets with sports. The Wreck is “different”. I like the distressed interior. Container wine– wine from a box or keg, rather than a bottle– is really awful stuff. For the most part, it tastes like the container, which is really bad if the container is a metal keg. One caveat on this list is that it’s incomplete. I suspect other places of having container wine as the house wine but have not verified that. I really like The Hub and Thunder Canyon as restaurants. At both places, the container wine in the house wine. My advice: dump the container wine and get a “pretty good” house wine. Container wine can’t be saving you that much money. The Junxion wine is so bad that the bartender warned me about it and offered a sip first. He was right. Happy hour, anyone? Have fun riding the modern street car. Thanks for the tip. I never heard of this place. I realize there are probably a few new places like this that are not on the list. 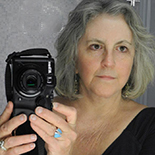 This entry was posted on July 21, 2014 by Pamela Powers Hannley in Arizona, downtown, economy, jobs, Rio Nuevo, Tucson and tagged 4th Ave, Arizona Inn, Barrio Brewing, Cafe Passe, Coronet Cafe, Hotel Congress, Images.